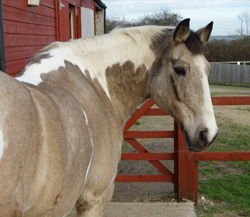 Ruben is a recently retired, coloured cob. Delightfully easy-going and calm - a pleasure to study. 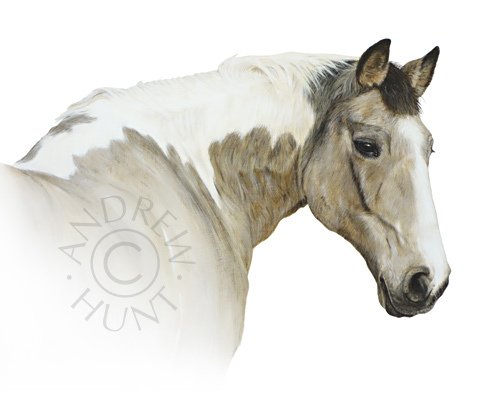 The painting was commissioned as a birthday present for his owner. Rather than producing the painting in advance, without the owner's knowledge, she was presented with a ﻿personalised 'Voucher'﻿ inviting her to arrange the painting directly with myself. This enabled us to meet up, discuss requirements & ideas in detail and make appropriate studies of Ruben, resulting in a smooth & successful project. Maggie's response to the finished painting: "
"It is absolutely beautiful. The likeness is stunning and to have my boy captured in time so perfectly is lovely. Thank you so much." The selected photo, from the set I produced when visiting Maggie and Ruben. Note the distinctive dark colouration along the line of the facial crest.